This debut short-story collection from Queen’s Ferry Press (October 2012) is made up of nine stories about people who find themselves at difficult turning points in their lives—times when they are faced with hard choices, broken promises, and the fear of self-destruction. These characters are diverse: a film projectionist, a second-generation comic book store owner, a vascular surgeon at one of Boston’s premier hospitals, an ex-baseball player turned financial advisor. All these characters attempt to smash through the inexplicable glass ceiling of their lives and make sense of a world that, more often than not, defies them at every turn. In “Union Terminal,” a self-made businessman hides his brother’s alcoholism as he sits by the bedside of their father, an overweight ex-con contemplating open heart surgery, tentatively exploring the layers of their history. “Projection” is the story of a college student who spends her last summer before graduation working as a film projectionist whose new boyfriend may have an explosive secret of violence. “The Utility Room” is about a young divorcee who rents out a spare room in her house to a mysterious adulterous couple, and their haunting infidelity allows her to strangely reclaim her lost sense of self. In “The Re-Creationist,” a veteran of World War II thrives as a baseball broadcaster mastering the art of “re-creating” games, only to find that the new post-war era has discarded the imagination for the furious speed of modern technology. The stories in this collection are startling and realistic evocations of the lives of memorable characters, told with energy, compassion, and grace. 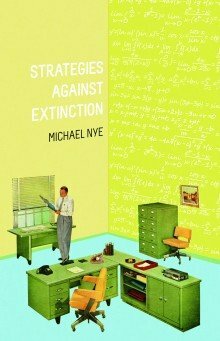 STRATEGIES AGAINST EXTINCTION is available from Amazon, Barnes & Noble, IndieBound, and fine bookstores everywhere.